While in the throes of a narrative writing unit my students asked, do we really have to write non-fiction narrative about ourselves? We like writing make-believe stories so much better. And I thought about it... Why not? As long as they are still writing narratives, still learning writing skills and meeting standards and expectations, who cares what the stories are about. In fact, shouldn't I be encouraging curiosity and creativity? And so it began, the students had the freedom to write any type of narrative fiction or nonfiction they desired. And guess what? They were happily engaged rather than drudging along doing the minimum possible. But then it was my turn. Having noticed that my students were loving graphic novels, I offered the use of comic book paper. It's so simple, yet seemingly silly and insignificant. Well, not to my students. With the addition of comic book paper, I had non-writers writing during recess time, I had children who had once cried because it was writing time cry because they had missed the free time to write on their own. There were comic book making birthday parties, collaborative comic books, and comic books copied and sold to raise money for charity. The best part, my students began to see themselves as writers, not as kids who had to write during writing time, but authors in their own right. Once they were confident in the graphic novel and comic book genre, they expanded their horizons and wrote nonfiction and how-to books. They wrote books about topics they were studying in class or just interested in. The only genre they never really explored... the personal narrative. Don't get me wrong, they still had to learn to write a personal narrative, but by giving my students the freedom and responsibility to choose for themselves, I helped them see themselves as writers with important gifts to share with the world. Now THAT is why student choice matters! Let's Be Thankful... for each other. It was time to put something new on the white board wall. Yes, you read that right. I have three of the walls in my classroom painted with whiteboard paint, plus whiteboard tables. Talk about thinking space. So today, on a whim, I wrote a question at the top. "What is the best thing about you?" and asked the students to write their responses. Some responses were short, some were long lists, but everyone enjoyed writing something. But the best part, for everyone, was reading the responses. Students put things you would expect, like "I care for animals." and "I'm good at soccer." But then there was "I am color blind." and "I am a loyal and loving friend." There was even "I love math." and "I am a good reader." It was very interesting to see what students chose to say about themselves. I can't wait to put some more questions on the wall. This was such a fun way to get to know each other just a bit better. I have a dear colleague at school who is an excellent teacher and with whom I love to work. However, we are as different as chalk and cheese, as she would say. And so, we often don't see eye to eye and even get frustrated with each other. I'll use a swimming metaphor to explain us. I'm the one running at full speed, cannon balling off the dock, and coming up with algae in my teeth, laughing and splashing around. Give me something new, and I'll try it. If it's not for me, I move on. My friend, however, she'll sit on the edge of the dock, stick in her toes to test the water, lower herself in gingerly checking for the bottom, and then she'll swim about peacefully. So in the real world, I'm all about experimenting, and she likes step-by-step directions. I feel like creativity blossoms when barriers and certain expectations are removed. My counterpart, she's trying to prevent the frustration that leads to burn out. One day, as she was wanting directions and I was wanting free exploration, I realized she is the yang to in yin. Balance. Yes, we need to fail forward, and yes, we need direction. To go back to the analogy: Niether approach to swimming in the lake is wrong, nor is either necessarily better. So I have realized that in teaching, I need to get out of the way of the cannon ballers in order to let them learn from their mistakes. But I also need to allow time and space for the toe dippers to ease their way into something new, and maybe even hold a hand now and then. But then of course, it can be good fun to just push someone in. Do Your Job and You'll Save a Life! This post was inspired by my dermatologist, Dr. Miller, who literally saved my life. I was in for a routine appointment and he found and removed a mole with melanoma. He caught it at stage zero, so I'm considered cured. Whew... I had missed it, but he didn't. All he had to do, was his job, and it saved my life. So what about us educators? I figure we save lives every day. Think of the PE coach who starts the morning running club. Now, that child who struggles academically, runs the most laps every year. The running club may have just saved that child. What about the librarian who finds just the right book that hooks the dyslexic student, and gets his reading started? She just may have saved him. What about the teacher who spent a few extra minutes, letting a student know that she was not alone in her family difficulties? She just may have been saved by that few minutes of caring. Will any of these educators ever realize the tremendous impact that they had on these students? Probably not, but it doesn't matter because we aren't in this for glory. We are here to repair the world. So here is my challenge to you, teachers: Do your job, do it well, and save someone without every even knowing you did it! 1. May you open your mind in order to experience the joy of discovery. Isn't this why we teach? Of course it is! We want our students to become lifelong learners who continually seek to better themselves through study. But in order for this to happen, discovery has to occur in its natural, awe-inspiring, wonder-producing state. It certainly shouldn't be scripted away by a teacher's manual. 2. May you understand that asking the right question is more important than giving the right answers. We've all had those students who can read out loud beautifully, but lack comprehension skills; or the student who has memorized their multiplication facts, but has no idea how to apply mathematical theory to their lives. This is not the point of education. Creating critical thinkers is the point of education. Asking the right question, means that you understand the problem at hand. If you don't ask the right question, then the answer to it is of no use. If my students recognize this, then they can be the Louie Pasteur, Steve Jobs, or Picasso of their field; someone who asked the right question, and found an answer that changed the world. 3. May you attain a sense of accomplishment as you fail forward in order to reach a goal. There is a lot of talk out there about failure, but failure means giving up. We want students who can persevere through setbacks, tribulations, and mistakes. This is the only way that honest-to-goodness discovery can take place. This is what it will take for one of my students to develop a cure for malaria or develop an inexpensive way to get water to drought stricken farmers. 4. May you discover that learning gives purpose to your life. I truly hope that same idea, somewhere in my students' educational careers, will inspire them to do something wonderful with their lives. Will they invent a life-saving medical device that stems from their love of origami? Will they become a best-selling novelist, even though they found writing tedious, but still had creative ideas to share? Will they open a shop catering to a niche market of customers that only they had the compassion to understand? I certainly hope so! 5. May you merit the friendship that develops from working as part of a team. Let's face it, you can be a genius, but if you are a jerk, no one wants to work with you. You have met these people before. They are brilliant, but working with them is so tiresome, that it's not sustainable. I absolutely do not want my students to be "that person." How you play is just as important as what you know, and sometimes even more so. If one of my students is to negotiate peace in the Middle East, then they'd better have well-developed social skills. 6. May you delight in the process of making the world a better place. And now we get to the real reason I teach. I have admitted it repeatedly, and I remind my students daily. For me personally, the world is an amazing, beautiful, and love-filled place. However, this isn't the case for everyone in our world. I expect my students to make the world better than it is now. And I want to live in, and experience that world. This is their one true assignment, the one by which they, as a person, will be measured. THIS is the assignment where they most need to earn an A+. And darned it if I won't do my damndest to help them do it! What do You Mean I'm Not the Most important Adult in the Lives of My Students? Aw man! 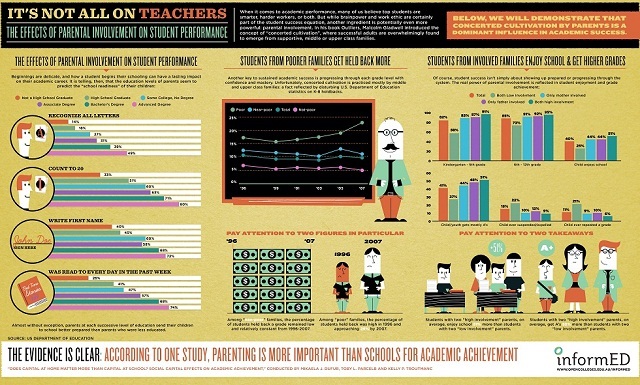 I just happened upon this infographic in the best place on the Internet for teachers... Twitter. Wow! Now in reality, we all know that parents are far more important in the lives of their children than we teachers could ever hope to be. And that is just as it should be. But parents, your direct and supportive involvement has a drastic and lasting effect on your child's education, and therefore their success in life. It is also no secret that income is often directly correlated with school achievement and success. But just look at some of the numbers in this infographic, look at the immediate negative effect that the recession had on certain students students. I wouldn't have thought it to be so drastic. So, this is a call to action! Parents, break the cycle of poverty and continue the cycle of success by involving yourself, immersing yourself, in the education of your child. If you don't understand what they are doing, have them teach you. Ask the teacher, find a tutorial on YouTube. It will help your child and you can learn along with them. Educators, this doesn't mean you're off the hook, quite the opposite in fact! This means you have to foster parent involvement where it is high, but more importantly, nurture it and grow it where it is low. This is our chance people! If we work together we can improve the education, and the lives, of countless students. This in turn will improve the lives of their families and ultimately of our society as a whole. All right, I'll admit it here in a public forum, I have very selfish reasons for putting out this call to action. I want to live in this improved society. I often tell my students that when they run the world I expect them to do a better job than those who are running it now. I expect them to cure diseases, make beautiful art, invent something to make the lives of others better, and be fantastic parents themselves. But I also expect them to work hard, to think, and to solve problems both big and small. So who's in? Who wants to live in this new and better world with my students and me? Won't you join us? We'd love to have you!